The G20 in Argentina offers Presidents Xi and Trump a rare chance to talk. Whether they’re new best friends or estranged fellows, President Donald Trump and President Xi Jinping have confirmed their bilateral meeting at the November G20 in Buenos Aires, Argentina. This will be a high-stakes encounter, as the future of US-China relations has not been so uncertain since President Nixon’s visit to China in 1972. If this meeting is not to be wasted, it is crucial that President Trump and President Xi focus not on skirmishes to seek reciprocal concessions, but rather offer political support for a durable resolution of their differences. The review and refreshment of multilateral and plurilateral rules and covenants, through World Trade Organization (WTO) reforms, would enable this. The Presidents would not only help each other’s economies, but more importantly, spare the globalized economy from the perils of fragmentation and a return to the law of the jungle. In spite of pressure from Washington, President Xi is unlikely to swallow any bilateral concessions at the G20 meeting, for two reasons. Firstly, President Xi understands that bilateral deals with this US Administration are politically vulnerable. In May, Xi’s envoy Vice Premier Liu brought home a joint statement in which both sides agreed to continue high-level dialogue and seek to resolve disputes in a “proactive manner”, not imposing tariffs during ongoing negotiations. But Trump threw away that truce in the blink of an eye and imposed 25% tariffs on 250 billion Chinese products. High-pitched China-bashing rhetoric during the US midterm elections may have exacerbated China’s worries about further embarrassment. Secondly, from a legal perspective, China is not allowed to offer bilateral concessions exclusively in favour of US exporters. If it does so, it would violate the WTO’s principle of non-discrimination. When China lowers its tariffs or liberalizes the services sector, or strengthens regulations on intellectual property protection, it must do so universally for all other 163 WTO members, including the US. The clock is ticking. While much US business is holding its breath in the wake of Washington-Beijing tariff races, other countries are sparing no effort in tapping into the Chinese market. The popularity of the China International Import Expo in Shanghai in November proved this. As for President Trump, he has the tiger of tariff war by the tail. He can neither hold it, nor safely let go. If he continues these tariffs, they are sure to backfire. It is only a matter of how many more quarters he can wait before his re-election campaign. 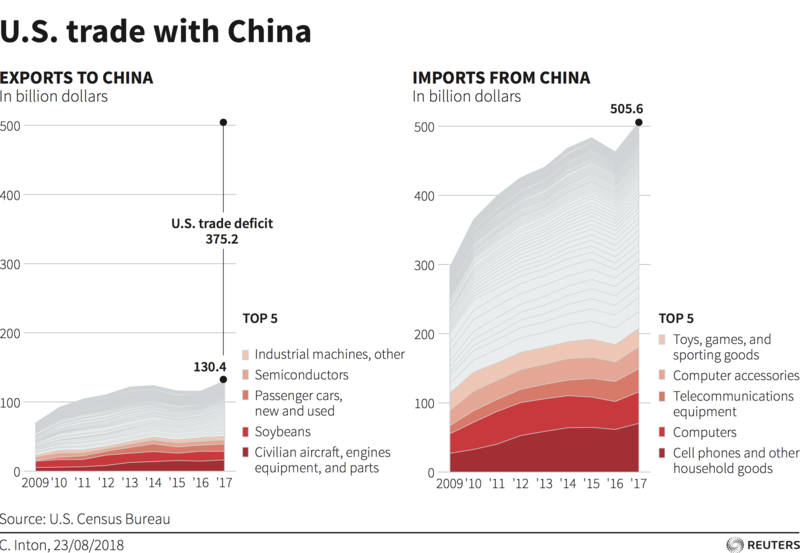 Economists widely believe that tariff wars may cause inflation of consumer product prices in the US, impact efficiency and cut off the profits of American firms involved in cross-border value chains, making the US less attractive to foreign investors. The WTO provides a space for the US and China to resolve their dispute in a “non-politicized” way, as suggested by its Director-General Roberto Azevedo. This is what the WTO is designed for: to address trade-related differences between members within an international law architecture that balances rights and obligations, and serves as a “safety valve” to keep politics at bay as much as possible. The WTO is both a permanent platform to negotiate new rules and market liberalization, and a system to resolve disputes. Already, the rest of the world has started preparations to persuade their US and Chinese counterparts to take part in discussion of WTO reforms, as shown in the Ottawa ministerial communiqué in October. Canada, the EU, Japan and 10 other WTO members at diverse levels of development joined this important exercise. What role will the United States play in the world? The G20 trade and investment ministerial meeting in September also paved the way for President Xi and President Trump’s discussion about reinvigorating the international trade system. In their statement, ministers “recommend our leaders consider these important topics”, including how “to improve the WTO to face current and future challenges”; what the G20 can do to address the current situation “in a collaborative manner”; and how to come forward with ideas to “ensure that the WTO continues to be relevant”. To balance the interests of the US, China and other members, President Trump and President Xi might consider the following six actions key to WTO reforms. These should be clearer and stricter about all forms of industrial subsidies. Attention should be paid to: the insufficiencies of the current agreement in levelling the playing field for state-owned enterprises (SOEs); stricter rules on fishery subsidies that contribute to overcapacity and overfishing; and distorted subsidies provided to farming. A rules-based system can hardly be effective when it operates in the dark. Furthermore, the legitimacy of 21st-century governance will be increasingly dependent on breaking asymmetries to information. Every possible way to provide full transparency about measures and policies affecting trade rules and enabling better negotiations must be explored. The US and China would do well to involve new information technologies and critical stakeholders in trade policy review processes; put their weight behind a real overhaul of the relevant provisions and means to ensure compliance with notification obligations; and encourage counter-notification. In particular, review 20th-century governance to fit the new context of global innovation networks and practices driving technology advancement and transfer. Clear rules should be made with respect to the extent that governments will or will not be involved in technology exporting and importing. About half the WTO membership has been engaged since December 2017 in exploratory work towards future negotiations on trade-related aspects of electronic commerce. Imperative now is to articulate new cross-cutting provisions that enable economic actors to use digitization to get the most out of existing rules on goods, services and intellectual property. Similarly pressing is to craft new frameworks to address growing unilateral protectionist inclinations in the absence of adequate competition, and draft taxation and facilitation regulations that ensure more predictable and inclusive market conditions in the era of the Fourth Industrial Revolution. It has become an urgent matter to move away from inadequate GDP comparisons that define a country’s eligibility to special treatment, and to design smart and dynamic rules based on sector-specific, purpose-defined thresholds. Legacy issues need resolution, such as crippling tariff peaks in developed economies and the update of rules governing trade in services. The US and China could also share ideas on how to re-engineer domestic policies and social contracts to help those disadvantaged by globalization. This is imperative for good governance on terms of engagement for the global economy. Fundamental disagreements on the functioning of the WTO Appellate Body cannot leave its members without recourse to justice. Alternatively, a new bifurcated system with two parallel tracks could be developed - one track for trade remedy and rules cases, and the other for all other issues. Remedy cases require additional legal and accounting expertise. At the heart of the US pushback to the existing system is a 20-year-old disagreement about the WTO’s rulings related to anti-dumping investigations. The US and China could pioneer a substantive discussion on the use of remedies in the new economy. In a time of hardliners getting headlines, the G20 rendezvous offers President Xi and President Trump a precious opportunity to have a fireside talk. They ought to be reminded of the responsibilities of their respective superpowers to their peoples, to the struggling global economy and to the Agenda 2030. Rules, not concessions, are crucial to solving their feuds in a sustainable way. The WTO reforms provide a timely platform for both sides to get out of the woods without being bitten by the tariff tiger.